C1 Advanced is an in-depth assessment of English. It provides high-level English skills for academic and professional success. Preparing for C1 Advanced helps learners develop the skills to make the most of studying, working and living in English-speaking countries. This advanced level certificate is accepted globally as proof of high achievement and is widely recognised by educational institutions, businesses and government departments around the world. 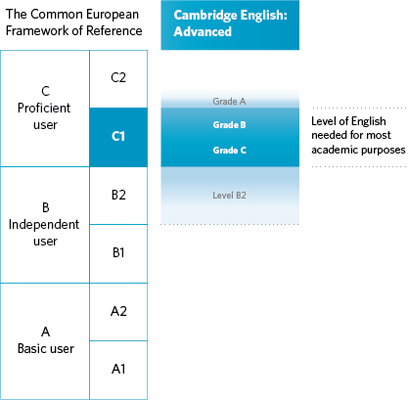 C1 Advanced (CAE) is set at Level C1 of the Common European Framework of Reference (CEFR) the internationally accepted system for describing language ability. The examination also provides reliable assessment at the level above C1 (Level C2) and the level below (Level B2). C1 Advanced offers proof of the English skills that education institutions and employers seek for high-achieving study and work situations. Successful candidates can prove to universities they are prepared for study, show employers they are ready to do business, and demonstrate to governments and immigration officials that they meet the language requirements for visas to enter the UK or Australia. C1 Advanced shows that a student has the language ability to carry out complex research, communicate effectively at a professional level – and stand out from the crowd. Students gain language skills they can use for university and professional situations, and for living in English-speaking countries. Candidates who have passed C1 Advanced have proven that they are committed to achieving high standards, possess the right English language skills to cope with the demands of study and work and have the necessary communication skills for everyday business activity. C1 Advanced uses research-based testing procedures to offer an in-depth, accurate and reliable evaluation of a student’s level of English. The Cambridge English Research and Validation team is the largest dedicated research facility of any UK-based language assessment organisation. 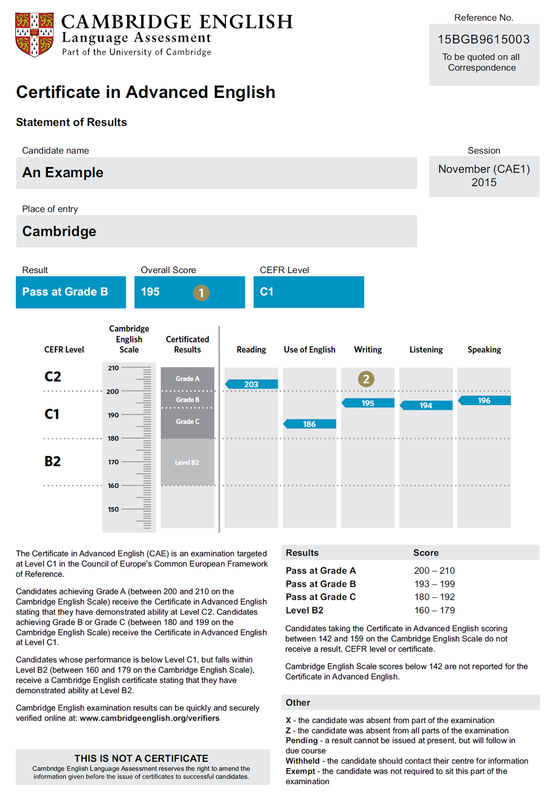 The C1 Advanced results are reliable because Cambridge English has built high levels of security into every stage of the design, delivery and administration of the exam. Exam papers are prepared, printed and despatched under secure conditions. Exams Madrid, Cambridge English Authorised Centre ES459, is required to follow a detailed code of practice which ensures the highest standards of security throughout the testing process, from registration to the recording of results. Photographs of all candidates are taken on the day of the exam and these can be viewed through the Cambridge English online Results Verification Service. All papers are marked in Cambridge to further ensure security and quality. Sophisticated analysis techniques are used to guard against malpractice. Certificates are printed on security-enhanced paper and include other concealed features to prevent forgery and malpractice. Choose when and how you take your exam - C1 Advanced is available as either a paper-based or computer-based exam, allowing you even more choice over how you take your test. More than 5,000 universities, businesses, government departments and other organisations around the world recognise C1 Advanced. In many countries, job applicants who can prove strong English skills have better access to jobs and higher earning potential. Get your results in just two weeks if you take C1 Advanced as a computer-based exam. C1 Advanced is a thorough test of all areas of language ability. The exam is made up of four papers developed to test your English language skills. You can see exactly what’s in each paper below. The Speaking exam uses a face-to-face test with two candidates and two examiners. This creates a more realistic and reliable measure of your ability to use English to communicate. The C1 Advanced Reading and Use of English paper has 8 parts and 56 questions and has a mix of text types and questions. Candidates are required to show that they can deal confidently with different types of text, such as fiction, newspapers and magazines. The paper tests their use of English with different types of exercise that show how well they can control their grammar and vocabulary. This paper accounts for 40% of the total mark. The C1 Advanced Writing paper has two parts. Candidates have to show that they can write different types of text in English. In Part 1 there is one compulsory question and in Part 2 candidates answer one question from a choice of three. In part 1 they read a text, then write an essay based on points included in the text. They will be asked to explain which of the two points is more important, and to give reasons for their opinion. In part 2 candidates write a text from a choice of text types – letter/email, proposal, report or review. To guide their writing, they will be given information about context, topic purpose and target reader. This paper accounts for 20% of the total mark. Monologues: radio broadcasts, speeches, talks, lectures, anecdotes, etc. Interacting speakers: radio broadcasts, interviews, discussions, conversations, etc. The C1 Advanced Speaking has four parts and is conducted face-to-face with one other candidate and two examiners. One of the examiners, the interlocutor, conducts the test (asks questions, gives candidates the booklet with things to talk about). The other examiner, the assessor, listens to what the candidates say. Part 1 is a conversation between the candidates and the interlocutor. The examiner asks questions and candidates may have to give information about their interests, studies, careers, etc. In Part 2 the interlocutor gives each candidate a different set of three pictures and asks him/her to talk about two of them. Each candidate has to speak for 1 minute without interruption and the interlocutor then asks the other candidate to comment on what he/she has said for about 30 seconds. Part 3 is a conversation with the other candidate. The examiner gives spoken instructions with written prompts which are used in a discussion. Candidates have to talk to each other for about 2 minutes (3 minutes for groups of three) about the written prompts. After the discussion time, the examiner will ask another question which requires the candidates to make a decision. Candidates have 1 minute to talk together and make the decision (2 minutes for groups of three). Part 4 is further discussion with the other candidate based on the topics or issues raised in the task in Part 3. The interlocutor asks each candidate some questions and he/she discusses them with the other candidate. The Speaking test accounts for 20% of the total mark. Almost all C1 Advanced Speaking Tests are conducted in groups of two candidates. However, if there is an uneven number of candidates at an exam session there will be one test with a group of three candidates, normally at the end of the day or before a long break. The test format is exactly the same but will last a little longer. Please note that you cannot request to take your test in a group of three. Try a paper-based sample C1 Advanced exam paper. Advanced 2015 Answer Keys. (Please note that there is no answer key for the Writing paper, but there are sample answers and examiner comments). There is no answer key for the Writing Paper, but there are sample answers and examiner comments on the relevant pages of the C1 Advanced Handbook. Please note you will need to use the Firefox or Chrome browser to view these sample tests. From January 2015 C1 Advanced results will be reported on the new Cambridge English Scale (replacing the current candidate profile and standardised scores). You will receive a Statement of Results. If your performance ranges between CEFR Levels C2 and B2, you will also receive a certificate. Please click on the image to the left of this text to find out the relationship between the CEFR levels, the Cambridge English Scale and the grades awarded in C1 Advanced. Exceptional candidates sometimes show ability beyond C1 level. If you achieve grade A in your exam, you will receive the C1 Advanced certificate stating that you demonstrated ability at Level C2. If you achieve grade B or C in your exam, you will be awarded the C1 Advanced certificate at Level C1. There is no answer key for the Writing Paper, but there are sample answers and examiner comments on the relevant pages of the Cambridge English: Advanced Handbook. Please note you will need to use the Firefox or Chrome browser to view these sample tests.